PhytoBerry™ is a highly concentrated whole food supplement that is loaded with natural anti-oxidants and phytonutrients. It features a comprehensive blend of over 40 high ORAC value fruit concentrates, phytonutrients, essential fatty acids and herbal extracts. Most importantly, PhytoBerry™ offers whole body antioxidant protection by using a harmonized and synergistic combination of nutrients that in concert target and protect each organ and key body system. 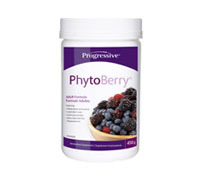 PhytoBerry™ has been professionally formulated, energetically tested and does not contain artificial ingredients. Mix 1 scoop (15g) of PhytoBerry™ into 250ml of water or your favorite juice. Consume 1 serving daily. Not intended for children, or pregnant or breastfeeding women.